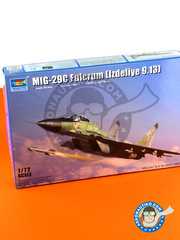 Gorgeous 1/72 scale model kit of the MiG-29 including two different decorations inside the box, one of the Russian Air Force and other from the Ukrainian Air Force. 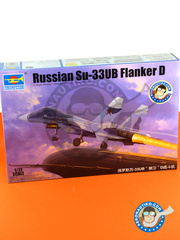 A huge scale model box for a huge real life plane, with nothing less than 480 parts, in addition to decals and photoetched parts. An incredible joy without any doubts. 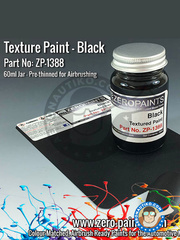 Set of colors to be used in american USAF and US Navy plane interiors deployed during World War II in all fronts, designated "World War II USA interiors". 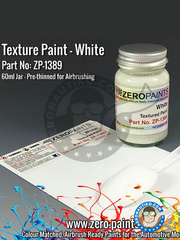 Including color tone FS33481 Zinc chromate yellow (ref. 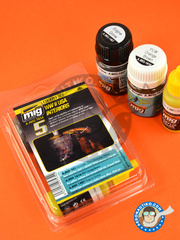 A.MIG-221), Orange Brown panel wash for yellow surfaces (ref. 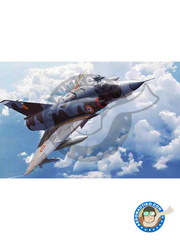 A.MIG-1616) and engine grime (ref. 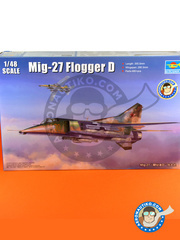 A.MIG-1407). 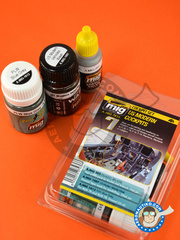 AMMO of Mig Jimenez: Paints set - US modern cockpits - Cockpit set - A.MIG-205, A.MIG-1007, A.MIG-1613 - for all cockpits and aftermarket detail sets for US modern cockpits. 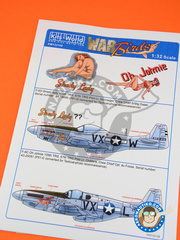 Decals for decorating the so called "Command Decision"unit with registration 44-87657, achieving the record of 121 bombing raids during the Korean War. 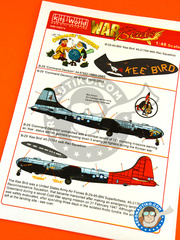 Second decoration belong to the "Kee Bird" unit with registration 45-21768, famous by the emergency landing performed over the Arctic tundra during a secret mission. 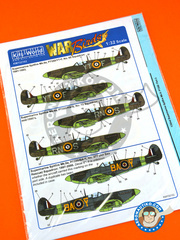 Extensive decals sheet with markings for the Supermarine Spitfire Mk.IIa units currently maintained nowadays by the RAF and ready to fly, recreating several units deployed at their time in the Battle of Britain. 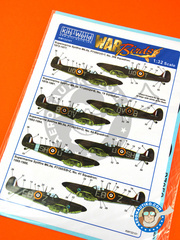 Decorations for recreating three different RAF units, still ready to fly nowadays, of the Supermarine Spitfire Mk.IIa which participated in the Battle of Britain. 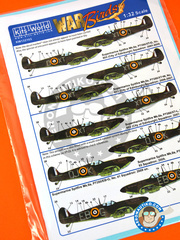 Interesting decals sheets with markings for all Supermarine Spitfire Mk.IIa units currently maintained nowadays by the RAF and ready to fly. Both decorations recreate the looks of these units during 1970 and 1980. 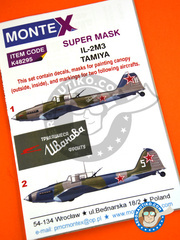 Includes masks for both canopy interior and exterior, as well as decals and masks for recreating two different decorations. 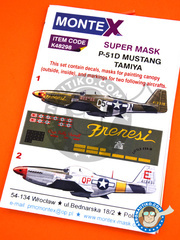 Masks and decals for the P-51 Mustang in 1/48 scale just like it operated during 1944. 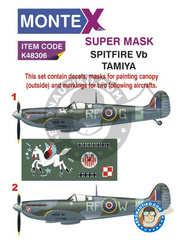 Decals and paint masks set for decorating the Spitfire in two different RAF schemes recreating two units operated by the 303rd Squadron in 1942. 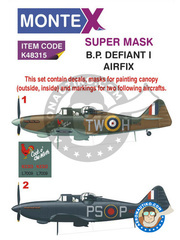 Two not very common decorations for the Boulton Paul Defiant. 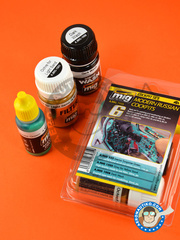 The set includes masks and decals for the paint job. 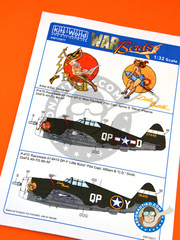 Decoratons for the P-47D Razorback with registration 42-7945 QP-D "Miss Plainfield", and for the unit with registration 41-6410 QP-Y "Little Butch", both at the 334FS 4th FG 8th AF. 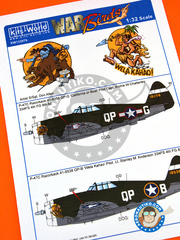 Decals based decoration for the P-47C Razorback with registration 41-6358 QP-G "California or Bust" of Captain Archie W Chatterley, and the P-47C Razorback with registration 41-6538 QP-B "Wela Kahao" of Lt. Stanley M Anderson, both operating at the 334FS 4th FG 8th AF. 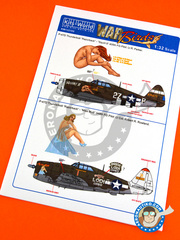 Decals for recreating both P-47D Thunderbolt Razorback "Squirt II" at the 405th FG piloted by Lt R. Parker, and for "Miss Mutt" at the 348th FG piloted by Lt Col. Robert R. Rowland. 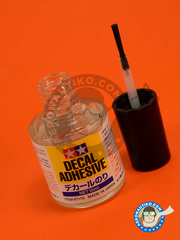 Decals for decorating the versión F-6D of the Mustang P-51 , this is, the units adapted for photographic reconnaissance. 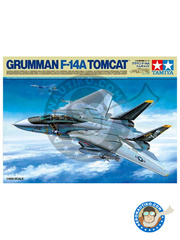 Belonging to the units "Shady lady" at the 109th TRS, 67th TRG of Lt. Slonneger and registration 44-14699, and "Oh Johnie" at the 109th TRS, 67th TRG piloted by Lt. Childers with registration 43-25081. 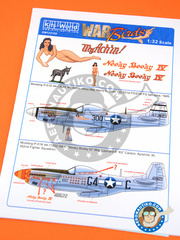 Decals for decorating the P-51D with registration 44-73623 "My Achin" piloted by Maj. Harry C. Crim in 1945 during the Iwo Jima battle, and the one with registration 44-11622 G4-C "Nooky Booky IV" piloted by Maj. Leonard K.